35 ready-to-use, no-fuss interactive activities you can use with confidence. No previous whiteboard experience needed! 35 ready-to-use, no-fuss interactive activities you can use with confidence. No previous whiteboard experience needed! Interactive Whiteboard Activities for Music calls upon your students to perform, read music and listen - as well as recall and apply their musical knowledge and understanding. 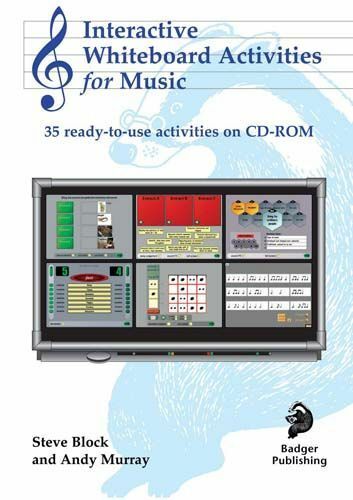 Every activity is well supported by detailed guidance and labelled screenshots in the Teacher's Book, and many also have associated sound clips, from Britten's Simple Symphony and Cuban Jazz to specially composed excerpts. All are flexible, so you can adapt them to your own teaching and learning environment. Varying degrees of progression are built into content and delivery options, so you can use them at KS3 and into KS4. Use them as: starters to motivate students at the beginning of the lesson, or to review and consolidate work from the previous lesson breathing points part-way through longer lessons plenaries to review and consolidate learning from the current lesson assessment opportunities - observe individuals and whole classes.